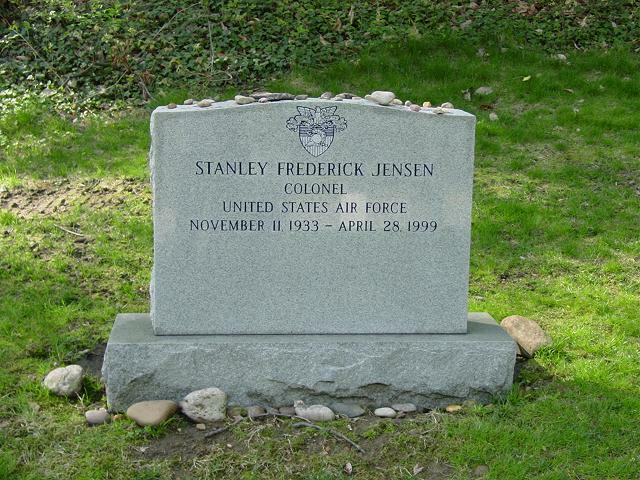 Stanley Frederick Jensen, 65, a retired Air Force colonel who later operated a home repair and welding business, died of cardiac arrhythmia April 28, 1999 at Arlington Hospital, Arlington, Virginia. Colonel Jensen, a resident of Arlington, was born in Bishop, California. He graduated from the U.S. Military Academy in 1957 and began his military career as a jet fighter pilot instructor in the Air Force. Later, he served as a public affairs officer at Andrews Air Force Base and the Pentagon. He also served three years in Germany, and he received a master's degree in business administration from American University. He retired from the Air Force in 1987. He graduated from Northern Virginia Community College with an associate degree in automotive technology and a certificate as an automotive electrical technician. In the late 1980s, he started an Arlington-based home repair and welding business. His avocations included travel to air shows and restoring automobiles. Survivors include his wife of 38 years, Rebecca Jensen of Arlington; three daughters, Gina Winkert of Potomac, Christine Aylor of Fairfax and Rita Jensen of Arlington; a brother; and six grandchildren. Morgan and David Aylor and Simohamed Jensen Jaouhari. Services will be held on Wednesday, May 19 at 9 a.m. at the Fort Meyer Old Post Chapel. Interment with Full Military Honors at Arlington National Cemetery. Memorial contributions may be made to the American Heart Association.